This view of the Ambassador Hotel is now obscured by the construction of the Regent Residences condominium development, on the site of the original Chavalit Mansion, which eventually became the expanded Ambassador Hotel. 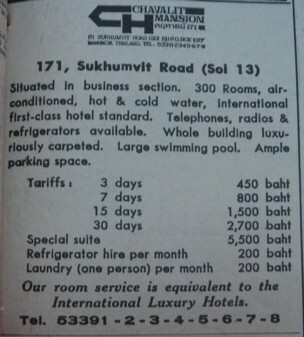 What is now the Ambassador started as the Chavalit Mansion/Chavalit Hotel, located right on Sukhumvit Road. 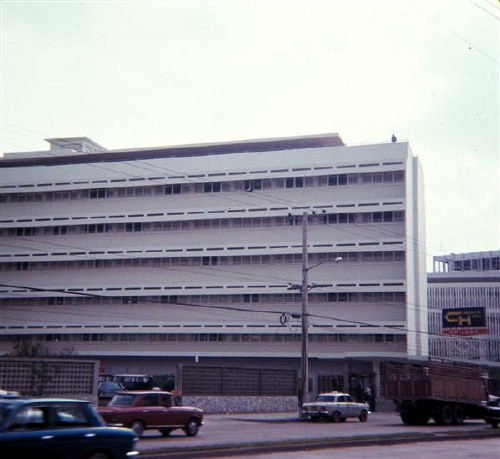 The larger building on Soi 11, which houses the modern day Ambassador, was built at a later date (early seventies) as an expansion of the Chavalit. 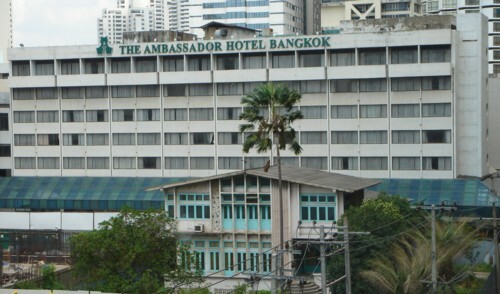 The whole operation was eventually renamed the Ambassador and was, at the time, Bangkok's largest hotel with 1,000 rooms. The Chavalit Mansion was at first a serviced apartment primarily used by the US servicemen. It bacame the Chavalit Hotel after the contract with the US military expired with the winding down of the war in Vietnam. Upon the departure of the US servicemen, Chavalit claimed 9.6 million baht in damages to the hotel, though the US government offered only 2.2 million in compensation based on a list of 300 damaged items submitted by the hotel. Despite the damages, the Chavalit Mansion building survived as the old wing of the Ambassador hotel until it was gutted by fire in late 2001, and demolished. Then, after housing an ad-hoc open air beer garden for a few years, the space became the site of the Regency Residences condominiums, curently being constructed. 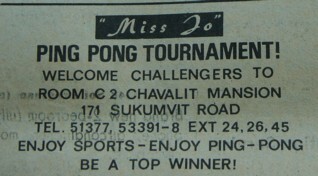 The hotel got its name from the owner, Mr. Chavalit Thangsamphan. Mr. Chavalit died in July 2001 at age 67, after building a hotel empire which started with the Chavalit Mansion, and grew to include the Amtel Marina Hotel in Florida and the 5000 room Ambassador City Jomtien complex, at one time the world's largest hotel. He left a 16 billion baht estate to his heirs. The original building which survived until the fire of 2001.